Pomegranates — one could write a book about their importance in world myth, folklore, history, cuisine, horticulture, medicine and nutrition. I recently read that Greek brides sometimes toss pomegranates instead of bridal bouquets at their weddings (take note Brides-to-Be: if your fiancé's obnoxious old girlfriend will be in the line-up for the toss, a Greek-themed wedding could be fun — wink wink — thud thud). In the spirit of another Greek tradition (smashing a pomegranate at the threshold of a house on New Year's Day to bring good luck), take a fresh pomegranate, crush it on a hard surface, drizzle honey on the fruit and then sprinkle a pinch of old-fashioned scented talcum powder over the sticky mixture (Spuma Di Sciampagna's Perfumed Talcum Powder perhaps). Sniff. What you smell will come close to Santa Maria Novella's centuries-old melograno (pomegranate) fragrance. Melograno is a sweet-tart, lightly floral, slightly powdery, unisex perfume. Due to the small size of the Terra Cotta Pomegranate, do not expect it to scent a large space; its throw is less than 8 feet. This is a perfect scented product to use on your desk at work (it won’t annoy your perfume-hating office mates). Santa Maria Novella claims the melograno fragrance "inside" the pomegranate lasts 9-12 months. The durability of the fragrance depends on where you place the Terra Cotta Pomegranate; if kept out of direct sunlight and away from the drying effects of heating or air conditioning vents, its fragrance will last longer. 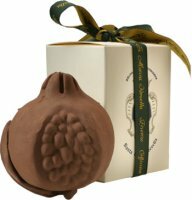 When the terra cotta pomegranate becomes scentless, use it as a paperweight, nestle it in a dish of potpourri, hang it from the Christmas tree…. At $55, the Terra Cotta Pomegranate is not an inexpensive home fragrance product. Santa Maria Novella’s Melograno candle, $52, scents a larger area but will, of course, leave you with nothing but a wax stub after it has completed its perfuming duties. For buying information, see the listing for Santa Maria Novella under Perfume Houses. Pomegranates have forever been linked to women and fertility for obvious botanical (all those seeds) and visual reasons (think about D.H. Lawrence and figs). But oh…my…. the swollen seeds in this little terra cotta number, that weird stem area, and the particular way they've cut it open make me blush! Not sure I'd want to be explaining this to my work colleagues (“Oh this? It's just my fertility rite scent ball, why do you ask?”) but perhaps its just me? Ha! Well down here in Texas they literally grow on bushes all over the place, and its hard for me to believe that anyone near a Middle Eastern restaurant wouldn't have seen one in person but you are probably right! A Greek colleague of mine gave me a sculpture of a pomegranate as a good luck charm and it's been sitting on my desk ever since. Now I'm definitely keeping it to see if I get any funny reactions! Thanks for the review, Kevin. The soap sounds wonderful and love the packaging. SMN opened a brand new boutique in Antwerp, so I'll be able to check it out soon. Checked the yellow pages but couldn't find an Annick Goutal shop in Antwerp. Too bad, coz it would've fitted in the perfume tour of Antwerp which I'm planning with a friend. But hey, Comme des Garçons, POTL, SMN, Hermès and Necessities (which carries a lot of the niche brands) is probably enough for one day! There's an Annick Goutal in Brussels though, so that'll be for my next fragrance foray. I don’t think anyone can tell you the exact ingredients, other than Santa Maria Novella perhaps. But it does have oakmoss, and that’s the biggest potential allergen.